The GridView control is the successor to the DataGrid and extends it in a number of ways. In some situations we have to display data in a Master-Child manner. In the following article, you can see how to create a GridView control to display data in a Matser-Child way. A GridView control inside the grid row of the parent GridView control is called a nested GridView. 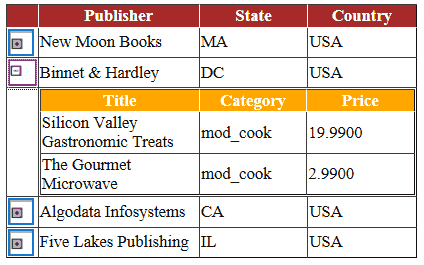 Here the program displays Master data from Publisher table and displays Child data from Titles table. Here the Gridview show Master/Details in Expand/Collapse way. When you click on + symbol the Gridview expand the row and inside the row it display the child Gridview. Then the row display a - symbol and when you click on the - symbol the it collapse and show the master GridView only. Here the program manage this expand/collapse using two images and it functioning with the support of a small jQuery function.